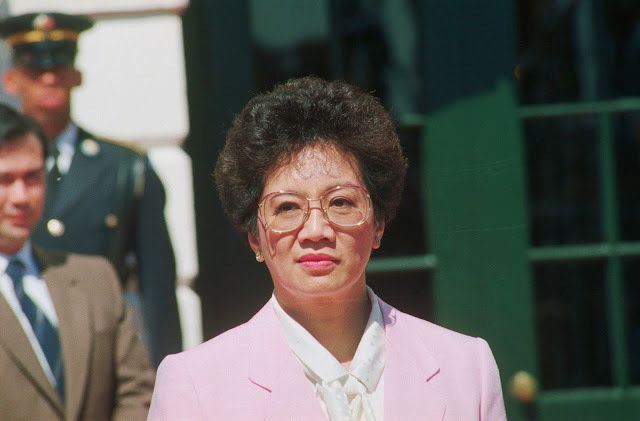 Home / News / Politics / How can Cory Aquino awards murderous terrorists as heroes? How can Cory Aquino awards murderous terrorists as heroes? The Light-A-Fire Movement is a group of classy men whose solution to the restraints of the Martial law was terrorism. They were trained in the United States and have bombed parts of manila in the early 1980’s. The movement was led by Heherson Alvarez, Raul Daza, Bonifacio Gillego, Charles Aila and an American citizen who was originally Greek, Steven Psinakis. • The September 12, 1980 incident where the bombing of Rustan’s Makati injured 70 people and killed an American tourist. • The October 4, 1980 bombing, the Philippine Plaza, Century Park Sheraton and Manila Peninsula hotels were also set a ablaze by the Light-A-Fire movement. • The October 19, 1980 bombing during the former President Marcos’ address to the international conference of the American Society of Travel Agents at the Philippine International Convention Center. In the last mentioned notorious act, Marcos made sure that the perpetrators were brought to justice, 15 people were arrested on the spot while 30 more people who were allegedly tied to the bombing were issued arrest orders. Some of those who were issued arrest orders include Ninoy Aquino, Steven Psinakis and 8 other US based individuals. Another arrest was made during a meeting of core members of the Light-A-Fire movement in Quezon city, Eduardo Olaguer, Gaston Ortigas and Ester Jimenez were all convicted and to be executed in 1984 via electric chair. US federal prosecutors were actually aware of the existence of the Light-A-Fire movement long before Marcos was brought down. They were supposed to arrest Alvarez, Daza, Psinakis, Gillego and Avila for terrorism that is directed to oust Marcos and the fact that the said individuals were training anti-Marcos exiles to utilize weapons and practicing the creation of bombs in Psinakis’ residence in San Francisco. Yet after the fall of Marcos and in with the revolutionary government of Aquino, the US Justice officials hesitated to actually press charges due to the fact that the terrorists actually became the heads of various agencies under Aquino’s Regime. Alvarez became the Minister of Agrarian Reform, Daza became the Commissioner of the Philippine Commission on Good Government (PCGG), Avila became the mayor of Tanauan, Batangas and Gillego became the executive director of the PCGG. Eventually in December 1986, the charges were filled but only Psinakis and Avila were ever named. Psikanis dropped the names of Alvarez, Daza and Gallego who were currently government officials, as his co-terrorists, while Avila was never arrested nor arraigned. "These charges never materialized. They were not even charges. They never matured into an indictment obviously because the prosecution had no evidence to sustain the indictment," Daza replied. "That's not true at all, I'm scared of bombs," Alvarez revealed. “My position on that issue is like the American position on nuclear weapons. I neither confirm nor deny," Gallego pointed out. In July 1987, at San Francisco International Airport, while on a business trip from Manila, Psinakis was arrested. He pleaded not guilty and bailed out on $200,000. Funny enough, the consul general of Aquino returned the foreigner’s passport due to commendations on his “brave and untiring efforts to restore freedom” in the Philippines. The Aquino administration was clearly commending and providing amnesty to a terrorist who endangered multiple Filipinos for he “restored freedom”. In August 25, 1986, President of the Philippine Senate, Jovito R. Salonga has been alleged of being tied to the Rustan’s bombing incident due to claims that the bombs were picked up at his residence in Manila. Yet the case never came into light. After being set free, Psinakis was awarded a Presidential Citation "for outstanding service to Philippine democracy and as an officer of patriotic Philippine exile organizations" by the Aquino administration. History may be written by the victors, but you cannot conceal the entire truth, there are witnesses to your crimes and despite being given a clean title, such as Hero, if you were terrorist you will always be a terrorist. Psinakis even said when interviewed about his citation that, "Rightly or wrongly, I'm perceived as a hero in the Philippines".